Bitsy Parks helps first graders early in the year engage with the library by introducing a series with companion stuffed animals to a small group. 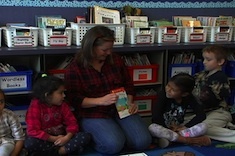 Bitsy Parks shares how she starts the day with literacy in her first-grade classroom. Bitsy Parks describes her process over the years in increasing both the quality and quantity of read-alouds in her first-grade classroom. 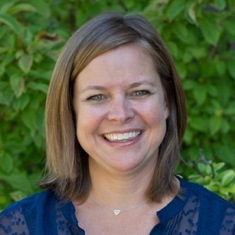 Bitsy Parks teaches her first graders to write sticky note reminders throughout the day, and is delighted by the learning and community building that ensues. 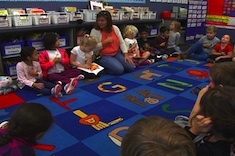 Bitsy Parks confers with first grader Leo early in the school year, reinforcing the basic principle of making connections to text while reading. 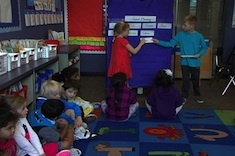 Bitsy Parks helps her first-grade students complete “thumb reflections” on making connections in reading early in the year by modeling connections from three conferences in a whole-class share session. Bitsy Parks shows how even the simplest picture book can lead to powerful conferring. 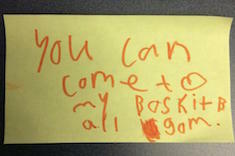 In this example, a first-grade English language learner is reading a picture book that uses only two words in the text.